The Sixty-one is a cool new website in the crowded streaming music genre. The nice thing is that it has a very nice player, robust database, and is fun. The only downside is that it is a little more resource-intensive than some of the traditional sites like Pandora and Live365. - Points: Has a Yahoo!Answers type of points/level system. - Free: Like Pandora, it plays free music. It isn't customized, but you can select genres. - Rating: Like Digg, you can identify songs that you like. This is the key feature of the site. - Investing: Like HSX, you can "invest" in songs you like and hope that others like them as well. 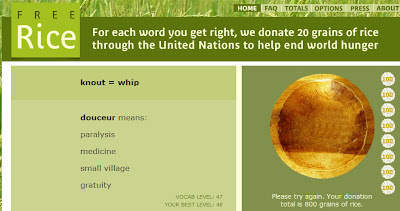 Free Rice is a trendy new website where you can (supposedly) give food to the needy while improving your vocabulary. Anyway, it is fun for a few minutes. Except the words get really hard and unfair at the higher levels. This poll is clearly flawed - Sean Taylor is not even in the top 20 defensive players, but he was just recently murdered and has been in all of the headlines. The question this raises is whether the poll administrator has either (a) the right, or (b) the obligation to correct this type of result. The above example is a no brainer - i.e. I doubt many people would complain if the Sean Taylor's results were stricken from the totals. 1. The Greenpeace poll where Mister Splashy Pants was voted as the top name for a whale. This was one of those internet campaigns where a large block of people conspired to skew the results of a poll. In this case, I think it is reasonable for them to throw out this name when choosing the winner. However, one could argue that in such case maybe they should not have chosen to use an internet poll in the first place. 2. The political polls where Ron Paul seems to show a much higher total than he would really have if any sort of election were held. This is likely because his supporters tend to be uncommonly fervent, organized, and internet-savvy. Several polls have been shown to have tinkered with his results, or removed him altogether, after he was voted into the lead. I think this is an example where it may be less appropriate for the poll administrator to be taking such an action. This issue is of special personal interest to me, since we used an internet poll back in 2000 to help determine our son's middle name. I've enjoyed following the progress the internet has made over the years in helping identify songs. A good site I found recently is Musipedia. 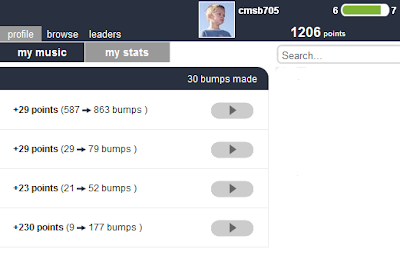 Of highest value is the Contour Search, which uses the Parsons method for identifying songs. You just start with the first note, then identify if each successive note is higher, lower, or repeated. It then matches against a large database. This was doubly helpful - it triggered the name of the song for me, and also helped me realize where the original song came from. I remember when the term "Jump The Shark" first came out a few years ago. First, no one had heard of the term. It gradually became more common. Then it became trendy. Then it became hackneyed and overused. It seems that we've now reached the point where you can't read a review of the second season of a TV series without this term inevitably popping up. So I am now claiming that the term "Jump The Shark" has ironically Jumped The Shark. One of the things I love about ebay is that it is such an efficient and transparent market. This means you can use it to gain an independent assessment of an item's true value. For example, consider a short sleeve Donovan McNabb jersey, sold in December. This would only have value to most buyers if Donovan McNabb will be playing on the Eagles next season. There is much debate among the "experts" as to whether McNabb will be playing on the Eagles next year. But I think we have our answer. The jersey sold for $1.25. McNabb is gone from the Eagles at the end of this season. You heard it here first. To help deal with the current mortgage crisis, President Bush has announced a potential plan to freeze interest rates on some home mortgages. This is to help avoid foreclosures in cases where rates are scheduled to rise sharply in the next 2-3 years. 1. Since this will increase the losses to the banks and investors that backed the mortgages, the cost of future mortgages will therefore increase - either through higher interest rates or higher fees. This is because lenders will have to raise the future cost of borrowing to account for the possibility of losses being incurred by unpredictable government intervention. 2. This will reward individuals who took out loans they could not afford, while penalizing those who correctly calculated that they could not afford these loans. This type of perverse reward system will encourage people in the future to make investments they can not afford, with an expectation that the government will bail them out if problems arise. If this is the case, then the lender will freeze the rate on their own, without being forced to do so by the government. In this scenario, the government is forcing losses upon the lender for a mistake that was made by the person who took out the mortgage. I think this proposal will take a bad situation and make it worse.